Simon & Schuster, 9781501172496, 272pp. From one of the world’s most celebrated moral philosophers comes a thorough examination of the current political crisis and recommendations for how to mend our divided country. For decades Martha C. Nussbaum has been an acclaimed scholar and humanist, earning dozens of honors for her books and essays. 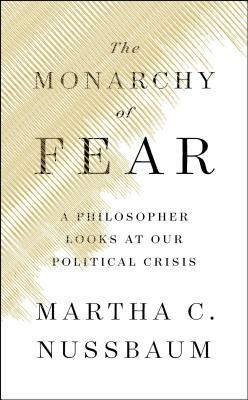 In The Monarchy of Fear she turns her attention to the current political crisis that has polarized American since the 2016 election. Although today’s atmosphere is marked by partisanship, divisive rhetoric, and the inability of two halves of the country to communicate with one another, Nussbaum focuses on what so many pollsters and pundits have overlooked. She sees a simple truth at the heart of the problem: the political is always emotional. Globalization has produced feelings of powerlessness in millions of people in the West. That sense of powerlessness bubbles into resentment and blame. Blame of immigrants. Blame of Muslims. Blame of other races. Blame of cultural elites. While this politics of blame is exemplified by the election of Donald Trump and the vote for Brexit, Nussbaum argues it can be found on all sides of the political spectrum, left or right.